Influenza season is in full swing for 2018-19 as flu activity across the United States increases, the U.S. Centers for Disease Control and Prevention reported earlier this week. According to the CDC's most recent FluView report , there is more flu activity being reported, including increases in influenza-like-illness and confirmed flu cases. In addition, a seventh flu-related child fatality was reported this week. "CDC monitors and analyzes key flu activity indicators every week," the CDC news release says. "After sustained elevated activity is observed across key indicators for a number of weeks, flu season is said to have started. 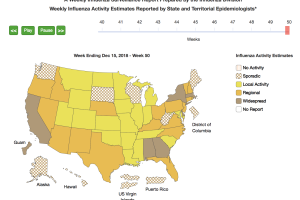 Flu activity met those criteria for the week ending December 15 (Week 50)." The influenza H1N1 viruses have predominated across the nation so far this season. 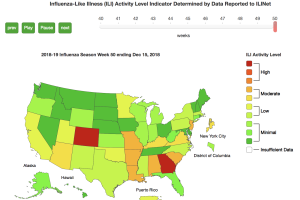 However, the past three weeks have seen a rise in influenza H3N2 viruses in the southeastern part of the country, or region 4 of the U.S., as designated by the U.S. Department of Health and Human Services. This region includes Alabama, Florida, Georgia, Kentucky, Mississippi, North Carolina, South Carolina and Tennessee. Each region's influenza and flu-like illness activity as of last week can be seen below. For the complete weekly report you can go here . To see how the flu has progressed in your location, go here .